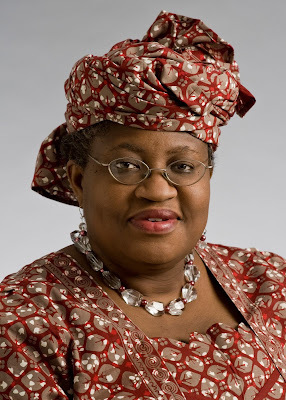 The National Economic Council, chaired by Vice-President Yemi Osinbajo, on Monday accused former Minister of Finance and Coordinating Minister of the Economy, Dr. Ngozi Okonjo-Iweala, of spending $2.1bn from the Excess Crude Account without authorisation. “We looked at the numbers for the Excess Crude Account. The last time the former Minister of Finance and Coordinating Minister of the Economy, Mrs Ngozi Okonjo-Iweala, reported to the council, and it is in the minutes, she reported by November 2014 that we had $4.1 bn. Edo State Governor Adams Oshiomhole told State House correspondents after the NEC’s 58th meeting in Abuja. According to the economic council, the ‘unauthorised’ spending is among the several anomalies discovered in the management of the nation’s economy between 2012 and May 2015. Due to this reason, the Federal Government has constituted Oshiomhole, Kaduna State Governor, Nasir el-Rufai; Akwa Ibom State Governor, Udom Emmanuel; and Gombe State Governor, Ibrahim Dankwambo, into a panel to probe the NNPC and the ECA between 2012 and May, 2015. Oshiomhole, el-Rufai, Emmanuel and the Zamfara State Governor, Abdulazeez Yari, jointly briefed journalists at the end of the meeting. Yari told journalists, through the Director of Funds, Office of the Accountant-General of the Federation, Mr. M.K. Dikwa, that council members received the report of the ECA and unremitted funds by the NNPC. “On that line, a four-man committee consisting of the governors of Edo, Gombe, Kaduna and Akwa Ibom states was constituted to go through the books of the NNPC and Excess Crude as well as the Federation Account. ”The four-man committee will check the books of the NNPC, most especially the issue of excess crude and what is not remitted into the Federation Account. Explaining what happened at the NEC meeting, Oshiomhole said the NNPC and the Office of the Accountant-General of the Federation were compelled for the first time to provide information on the total sales of Nigeria’s crude from 2012 to May 2015. “We are talking about transparency; we are talking about change. And what we saw from those numbers, which I believe that Nigerians are entitled to know, is that whereas the NNPC claimed to have earned N8.1tn, what NNPC paid into the Federation Account from 2012 to May 2015 was N4.3tn. “What it means is that the NNPC withheld and spent N3.8 tn. “The major revelation here is that the entire federation, that is the Federal Government, the states and all the 774 local governments, the amount the NNPC paid into the Federation Account for distribution to these three tiers of government came to N4.3 tn and the NNPC alone took and spent N3.8tn. “If the Federal Government cannot spend without appropriation, why should any agency spend without appropriation. “This is what the Constitution provided for and this is what President Muhammadu Buhari has promised to do; henceforth all money must go to the Federation Account. El-Rufai said the account was set up in order to be accountable such that every state and local government would know what they had in the account though they could not spend it. “The Excess Crude Account is 52 per cent owned by the Federal Government and 48 per cent owned by the states and the local governments. “So the decision of the NEC is to set up this committee of four to look at the operations of the Excess Crude Account and make recommendations to council on its future. “The other thing the committee will do is to look at the operations of the Federation Account, particularly the shortfall and again come back to council with very clear recommendations as to what to do. “We have not been given a time frame but as you can imagine state governments are under pressure, many of our state governments are unable to pay salaries on time without recourse to borrowing, so this is very important to us. “This is an all-governors’ committee; we wear the shoes and we know where they pinch. So we are going to do this as quickly as possible.